You, Me and everyone want unlimited battery and gigabyte of application memory. As you have installed CyanogenMod, means you are keep tweaking with the phone. Here are few extra CyanogenMod tweaks. These tweaks will make your CyanogenMod battery to last longer and allow to install extra applications. That also without compromising on performance. You don't have to flash any kernel. CyanogenMod allow you to easily access root permissions. The root privilege allow you to remove all those unwanted apps and system components. Go to settings >> About Phone >> Now to go to developer options. Navigate to ‘Root Access’ and select ‘App Only’ root access. You can select other option as per your need. 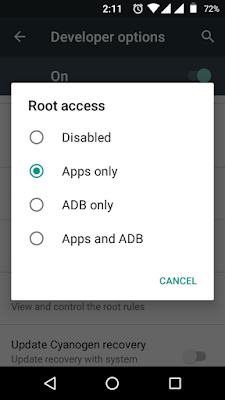 If you are not going to use ADB, keep it to app only. ➤System partition (/system) and Application memory (/data) are DIFFERENT. System is a partition of internal memory located at /system. Its where, the ROM is installed and contain all system components and preinstalled apps. ➤You can not remove, system apps unless you have root access. 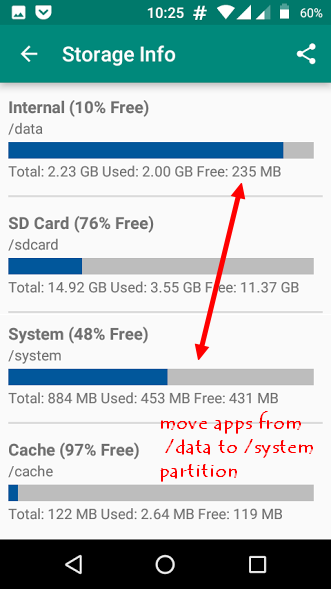 When you remove the any pre installed app or system component, you are making space in /system and NOT in the /data partition. ➤Any new application installed after wards by user will go to /data partition. Even though, you have memory available in /system partition, you can not directly install any app in /system. ➤So, even if you are making space in /system partition, you have to do convert, user app to system app to use that space. Application memory and system memory are limited in budget android phones. You can not install unlimited number of Android apps due to limited internal application memory. Be careful when you select the apps to remove. Install Link2SD app from Play Store. 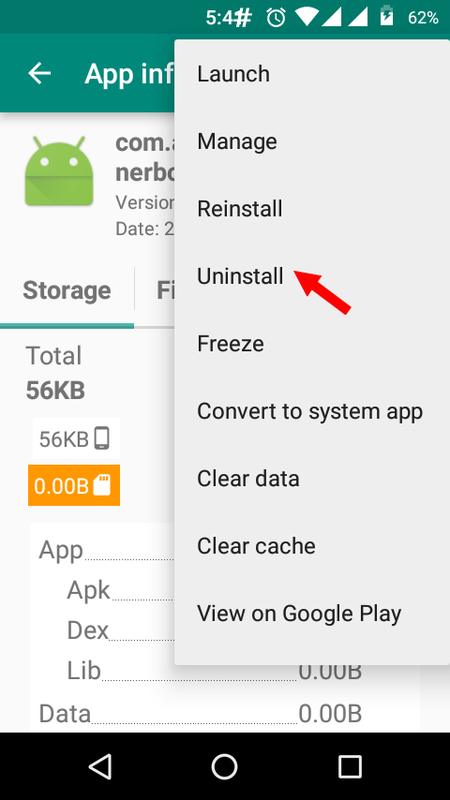 ➤Select the app you want to uninstall. Touch the option menu and select uninstall. Even if the application is not removable by native method, it can be removed by using link2sd application. ➤Though CyanogenMod do not come with any bloat app, you still have scope to remove the never used apps and features. ➤You can safely remove unwanted apps like Android Live wallpaper, black hole, bubbles, holo spiral, phase beam, sim toolkit etc. Most of these are animating wallpapers. 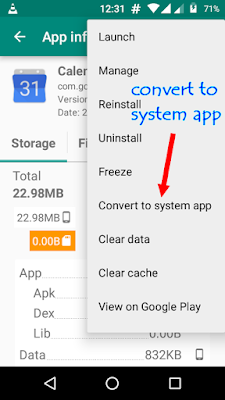 ➤You can also remove APK's of built in apps like Android Keyboard (AOSP), Android system web view, android fx, browser, calendar, (NO calendar storage), camera, email, exchange service, file manager, gallery, google text to speech engine. 3. Why remove Android System Components? They are no more useful and accommodate precious system memory. 4. Why remove Preinstalled Apps Even though you need them? Preinstalled apps are installed in /System partition of internal memory. When you update those apps, the original APK remain in the /system partition and the updated APK of the same app goes in to /data partition. This makes the same app to consume about double the size it actually need. 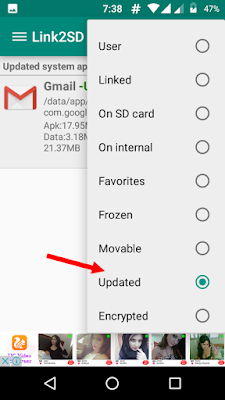 Take an example: When you update the Android System Webview, the built in app do not get replaced by the update app. The original APK remain in /system and new app is installed in to /data partition. 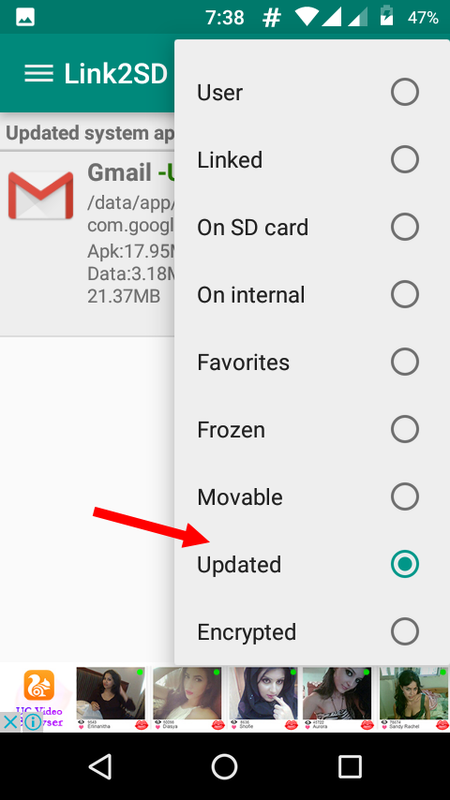 When you uninstall the updates or reset system to factory settings, the original apk get activated. You can safely remove such component. You can download the updated versions of the same apps from Google Play Store. If you use Google Chrome for Android or Firefox as your favorite browser, you can also remove the AOSP browser. The stock camera app is OK but I replaced it with the Google Camera app. This is important step to efficiently use the memory. As discussed above, when we remove system app, you are freeing up the /system partition. And you can not directly benefit from the space made available. You have to convert the user application to system application. You can simply say that, move application from /data partition to /system partition. ➤Select the application you want to convert to system app. ➤Touch the options menu (three dots). Select the option 'convert to system app'. 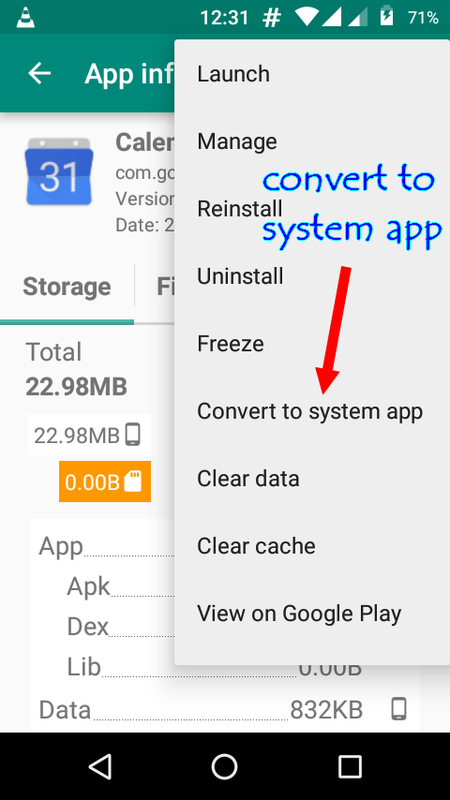 Don't randomly convert any app as system app. Keep in mind that, the system apps will have elevated access permission to your private data. Convert only apps that you trust or use very frequently. Like Apps from Google. Gmail, Google App, Google Now launcher, dialer, Google Drive or similar. As you know, updates to any application will install to /data partition keeping the original APK of system file as it is and consuming the memory. The apps that you have converted to system, when get updates, those updates also installed to /data partition. 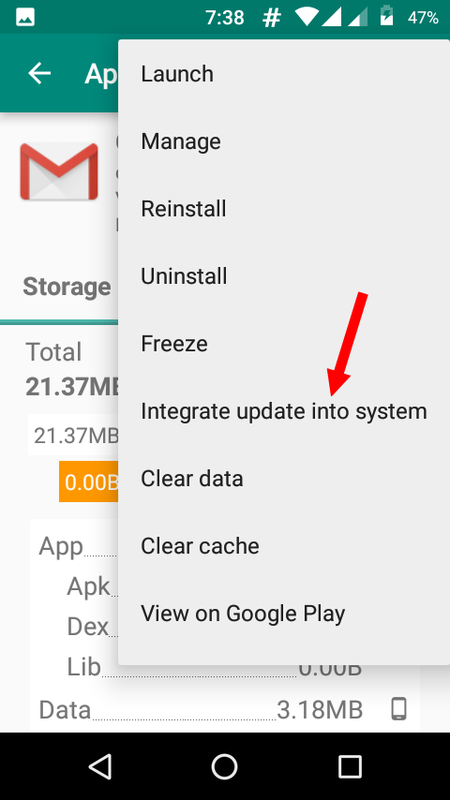 You can integrate this updated APK to system keeping all the settings and user data as it is. To find out the updated system apps, select the filter "updated". DO NOT CONVERT "Google Play Services"
Select other apps one by one and select the option "integrate update into system" option. What else you do for your old, memory shortage phone?